Did you pound the firewall to get full articulation in the wheel and tire? or maybe tire size is smaller? Hey welcome to Nissan Challenge. I have 18x9.5 +22 (265 30 18) and 15mm spacers in front (circuit sports s14 FLCA) and have no issue with it rubbing on the firewall, only on the front wheel well area. few pics from last event. Wasn't able to beat my personal best lap time with hankook TDs and brembos so clearly I'm doing something wrong. I'm gonna get back to drawing board and figure out how to make this thing faster. Just went through your build posts. Love it. 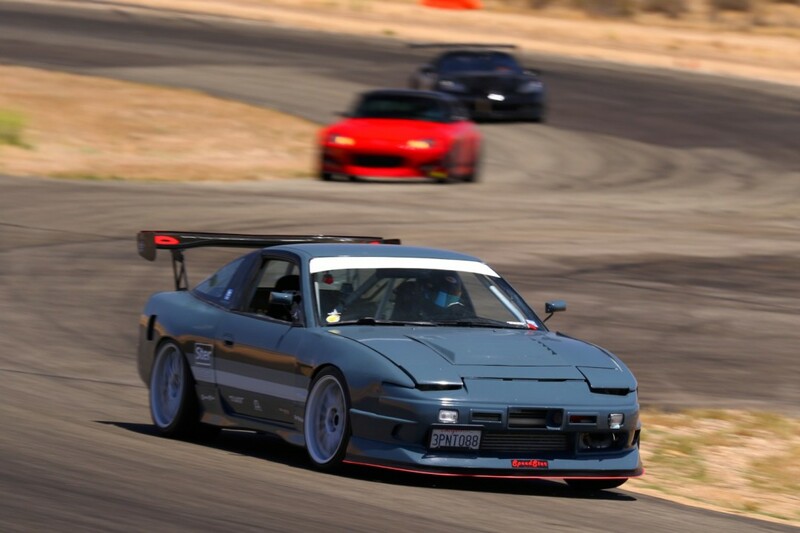 Im just finishing my grip build s14 and cant wait to hit the track. Congrats man, looks great, sounds great. thank you 02! post a picture of your s14 when you get a chance! Awesome build ! Which apr wing do you have and how big of a difference do you feel with it ? I have the GTC300. And Yes! big difference! Thanks for the info ! Could you post a pic of how it’s mounted? And do you plan on getting a rear defuser?and do you plan on putting cables on the wing stand for less flex ? 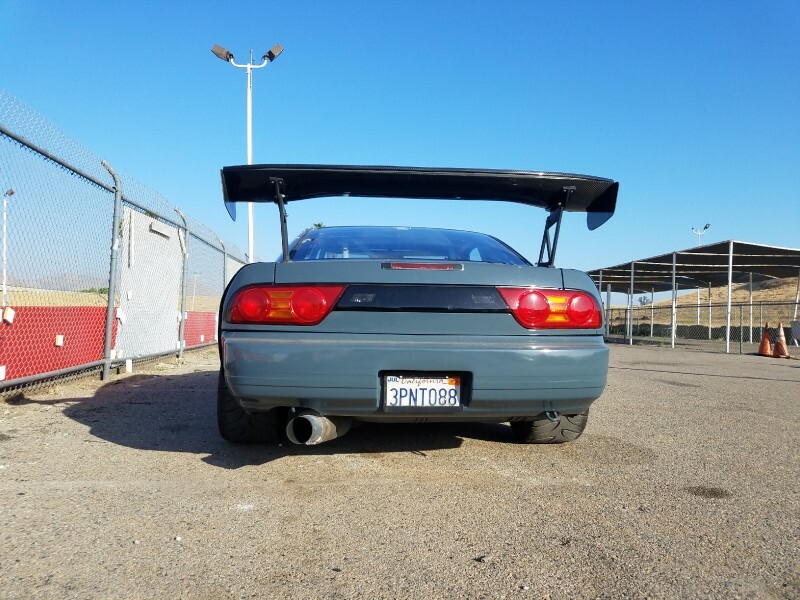 Sorry for all the questions lol not much info of people using a wing for what it’s inted for on a 240. This wing is actually from an evo10. When I took the measurements,evo mount width was the closest to the s13 hatch, and the height seemed to work out perfect. 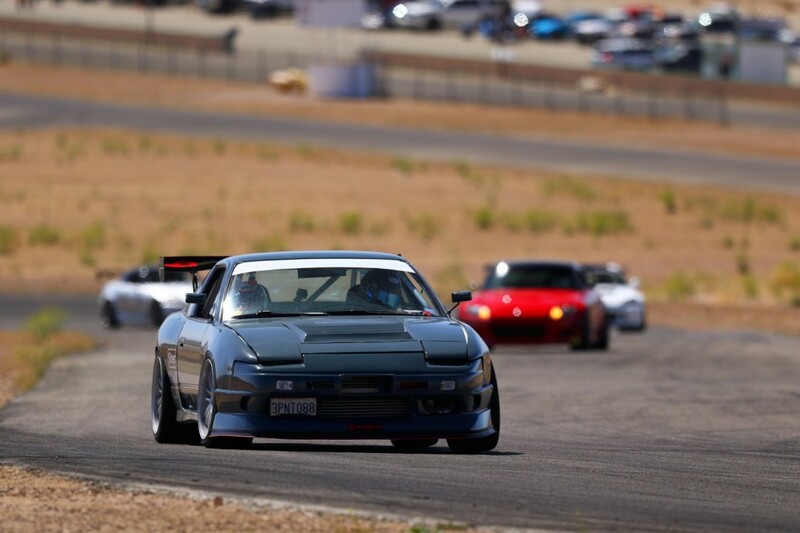 (time attack rule book states that wing cannot be higher than the roof, plus 3d shaped wings are effective if it's mounted lower than the roof). There are three studs on each wing posts that goes through the trunk and uses nyloc to hold it in place. it's pretty sturdy. rule of the thumb is to be able to stand on the wing. Rear diffuser will be added sometime later. I have not had time to work on it. I do not think cables are necessary as it does not flex much. I think that's mainly for looks (I have not had personal experience with it). Lol I’ll try my hardest but moms are my weakness, and thanks for the info. Those advan ao57s are $$$. How do you like them? I think you meant a050. those are actually Hankook TDs. They are good but I prefer nexen sur4g! 650hp must be handful haha. Ohlins pcv 8kg 6kg, whiteline front sway bar, all of the arms are aftermarket (mixed brands), stock knuckles, s14 subframe. How are you doing in Nissan Challenge this season! Hey slider! that's good news! On the springs, I would definitely go softer. I'm currently 8/6 with front splitter and rear wing (total weight 2800 w/ me in it). I think that might be a good baseline for you. I personally like soft setup ,but if you are running slicks, harder springs are definitely way to go. I haven't done much nissan challenge this year. I just did one @ streets of willow. 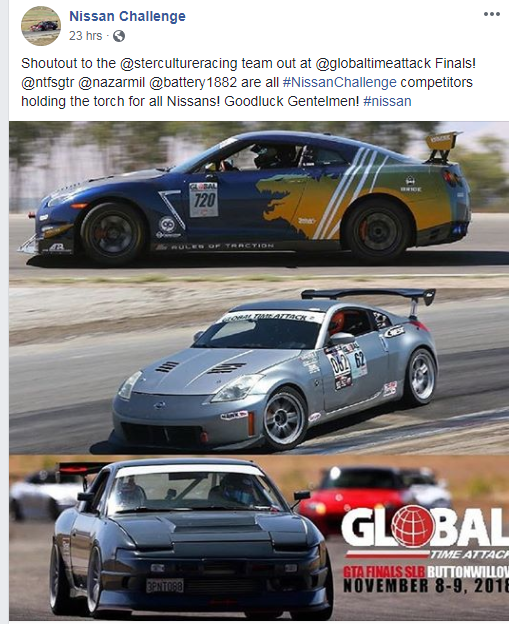 I'll be doing Global Time Attack Super Lap Battle this Thursday-Friday! Hope to hear back from you on your updates! Nissan Challenge is very supportive and is truly friendly atmosphere! You should come out to drive with us. Speaking of video, I 'll leave it here on the bottom. After noon, car starting smoking from the engine bay. I was chasing the problem. Day 2. I found out that it was actually from the high pressure power steering hose benjo fitting which had a hairline crack. it would squirt oil right on to the header every time I turned the steering wheel. I decided to pack up and hope for more solid run next time. Lovely read. I saw your car at GTA SLB last week, so glad I clicked on this thread. went to Streets of Willow CCW event with friends. with new tires (275/35/18) and bit more torque (E85) I was able to shave 2 seconds from previous best. This is awesome man. Love the build! Looked like you were about to slide into that C5 at the end. Cool vid. Thank you! Yeah corvette drivers usually don't let me pass so I made my own route lol.